The first Director of NCL, Professor J.W. McBain, FRS, Professor of Chemistry, Stanford University, USA assumes office (1949-52). "Therefore, the National Chemical Laboratory must not only apply existing knowledge to the beneficiation of Indian natural resources but it must also produce its own share of pure fundamental science. India must not only copy and adapt what is known elsewhere but it must make fundamental advances of its own in order to take its proper place amongst the nations. You and we, have this day dedicated a National Laboratory and its staff, with the assurance that its work will grow and serve this country and the world and continue for generations to come. It is with these high hopes that we have dedicated the National Chemical Laboratory of India." 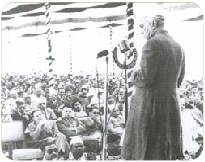 NCL formally declared open and dedicated to nation on 3 January 1950 by the first Prime Minister of India, Pandit Jawaharlal Nehru. The inaugural ceremony attended by six Noble Laureates and several distinguished luminaries from around the world. One of the most important functions of this Laboratory will be to bridge the serious gulf between scientific research and its industrial applications. It will work out ways and means for the application of scientific knowledge to practical problems of human welfare. NCL will stand or fall according to the quality of its scientific staff. It must achieve national and ultimately international recognition. The Laboratory will try to improve old processes in the light of new scientific knowledge and discover new processes. In short, the National Chemical Laboratory will be a living and vital link with the universities, scientific institutes and industry. Another principal objectives of this Laboratory will be to undertake fundamental research to extend the frontiers of knowledge. Fundamental research has always had a stimulating influence upon research workers and has attracted to the laboratory men who worked for ideals and whose motto is "it is better to have wisdom than gold"
"There is talent in our country. But the question is how to tap that talent and give opportunities to the young men and women of India, who had the requisite ability. I hope that so far as these laboratories are concerned they would help to some extent at least in opening the doors to a large numbers of young men and women and give them opportunity to do good work for the country in the cause of science and in application of science for the public good. With these words I declare this Laboratory open." "I would like to stress the practical value of scientific researches to be carried out at in the National Chemical Laboratory, although I do not believe that utility is the main incentive to scientific work. It is in man's attempts to study nature and to understand her secrets that science finds its best motive. For this reason, I believe that good laboratories alone are not sufficient to produce scientific work but it is the ability of the individuals who work in the laboratory that counts. I am sure that individuals of exceptional ability will work in the NCL and work for the advancement of science." 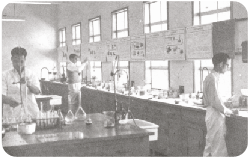 Professor McBain states the mission of the laboratory which is enshrined in the spacious podium of the main building "The purpose of this laboratory is to advance knowledge and to apply chemical science to the good of the people. The building of western design and magnificent propositions make an impressive picture set in a natural amphitheatre of hills, four miles from Poona. It is well equipped for scientific research in chemistry in both pure and applied fields. It will provide the possibility of effective cooperation between scientific research and industrial production, a cooperation which is essential to a sound economy. NCL structured into discipline-wise Divisions, namely, Physical Chemistry, Inorganic Chemistry, Organic Chemistry, Biochemistry, Plastics and High Polymers, Chemical Engineering and Survey & Information. Professor George I. Finch, FRS, Professor of applied physical chemistry, Imperial College, London, UK takes over as the second Director of NCL (1952-57). NCL establishes deep connections with the emerging chemical industries in independent India. Over 65 industries are served by NCL. NCL secures 46 Indian Patents during this period. NCL quickly establishes its credibility as a major centre for research in chemical sciences in India. During the decade 350 publications emerge from NCL and 22 students are granted Ph.D. degree. 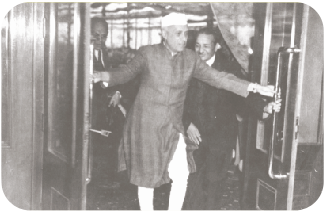 Shri Pandit Jawaharlal Nehru, Prime Minister of India visits NCL again in 1953 accompanied by his daughter Ms. Indira Gandhi and his grandson Shri Rajiv Gandhi. Professor K. Venkataraman, a distinguished scientist with seminal contributions to organic chemistry and chemistry of synthetic dyes, from UDCT now ICT, Mumbai assumes office as the third Director of NCL (1957-66). Professor K. Venkataraman firmly establishes NCL as a major center for research in organic chemistry with emphasis on synthetic dyes, drugs and pharmaceuticals, perfumery chemicals, flavonoids, terpenoids and wood phenolics.